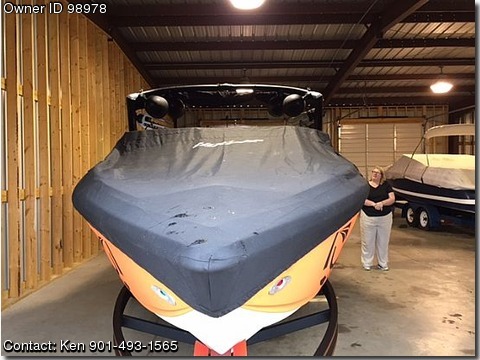 Please call boat owner Ken at 901-493- one five six five. Boat is located in Pickwick, Tennessee. 2012 WAKE BOARD BOAT FOR SALE LIKE NEW COST 78K NEW HAS LESS THAN 100 HOURS ON IT . HAS ALPHA Z TOWER WITH DUEL RACKS , TIGE TOUCH SCREEN ,CRUSE CONTROL,WET SOUND 10INCH SPEAKERS X 4 WITH CLARION CMD6 INTERGRATED MARINE CD RADIO,TAPS SYSTEM ,FRONT AND REAR BALLEST SYSTEM,CUSTOM BIMINI TOP ,CUSTOM MOORING COVER WITH TOWER CUT OUTS . AND A KILLER CUSTOM BOATMATE TANDAM AXEL TRAILERWITH SWING AWAY TONGUE AND DISC BRAKES. UNDER WATER LIGHT AND BATTERY CHARGING SYSTEM.